Connor may be 1/4th Chinese, but apparently there's no innate love for rice in the little guy. We got him some rice cereal to eat and so far it disgusts him like nothing else. The poor baby acts like we're killing him when we feed it to him. 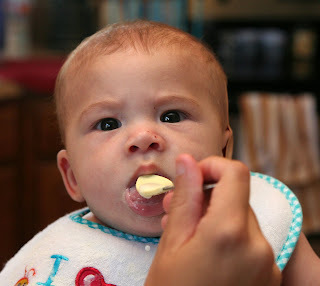 Upon our doctor’s advice we’re working on spoon feeding him and the skill is pretty hard to learn for both of us. As part of Andrea’s job she has to help patients eat, so she’s pretty good at getting the spoon to the right part of the mouth to trigger a swallow. 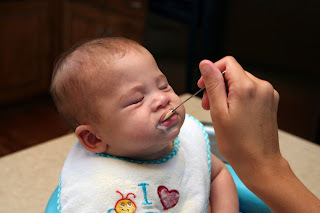 The one time I tried to feed Connor he gagged and I decided I’d rather take pictures than make the baby aspirate. Connor has trouble deciding what to do with the food once it’s in his mouth. He’s used to manipulating his tongue to get fluids out of a bottle, so once you stick the spoon in his mouth, his tongue thrusts out and most of the cereal comes out with it. We’re all still learning. Shawn's parents and brother Alex came to visit this weekend. Connor got his 4 month immunizations and was also running a bit of a fever (101.8 deg!) this weekend. He was fussier than normal and unfortunately Alex had to sleep (or try to sleep) in the room adjacent to Connor's. Saturday was a tough night for everyone. We still had fun though! It was sure fun to see Connor's reaction to solid food - one of these days you'll marvel at how much food he'll be able to put away and remember this in amazement....haha.